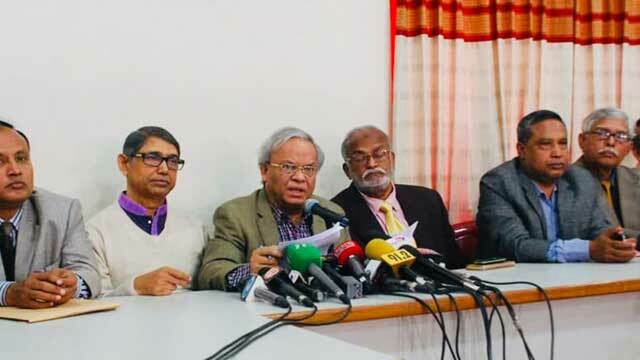 Stating that former minister Shajahan Khan is mainly responsible for the growing road accidents in the country, BNP on Tuesday termed absurd and mockery the formation of a 15-member committee headed by him to restore discipline in the transport sector. “The national committee to curb road accidents making Shahjahan Khan its convener is an absurd matter. This man is mainly responsible for the killing of a huge number of people in road accidents and chaos in the transport sector,” said BNP senior joint secretary general Ruhul Kabir Rizvi. Speaking at a press conference at the party’s Nayapaltan central office, he also alleged that Shahjahan Khan and his cohorts created obstacles whenever any movement was forged over the mismanagement and disorder in the transport sector. “So, the formation of a committee headed by Shahjahan Khan to bring back discipline on roads is nothing but a mockery with the nation. It seems a thief is given charge for holding the trial of theft,” the BNP leader observed. On Sunday, the 15-member committee, headed by Shahjahan Khan, was formed at the 26th meeting of National Road Safety Council held at the office of Bangladesh Road Transport Authority (BRTA). The committee will recommend within 14 days how to control road accidents and restore discipline in the road transport sector. Earlier on Monday, an opposition MP criticised the government in parliament for making Shajahan Khan the head of the 15-member as his various comments about transport sector sparked widespread controversies in the past. However, Road Transport and Bridges Minister Obaidul Quader said Shajahan Khan was made chief of the committee as he is an experienced person in the sector. About the suspension of gas supply for 12 hours on Tuesday at different parts of the country, he said it has manifested the rule of a cruel authoritarian government as it took the step without any alternative arrangement. Rizvi said the disruption of gas supply has put the city dwellers into a serious trouble as there is no alternative for them to cook foods. After the disruption of gas supply for around 26 hours here, the government suspended the gas supply for 12 hours today at different parts of the city as the authorities concerned is shifting pipelines to facilitate the construction work on the metro rail project. Rizvi also opposed the government’s approval of three more new banks when he said the country’s banking sector is going through a serious problem due to mismanagement and plundering. “The approval of three more new banks has widened the path of looting banks and public money,” he said. “It’s an absurd matter that the Finance Minister himself said he was not aware of approval of the banks,” Rizvi said.